The Haynes family became involved with property now known as Thornbury Grange when two brothers, Christopher and Joseph Haynes were each left half a moiety in the property at Thornbury together with several closes of land around the house under the will of Sarah Hawksworth dated 16th February 1770. Note that several of the records show the name as ‘Haines’ rather than ‘Haynes’. The Haynes were a wealthy family which had its roots in Westbury on Trym where they traded as grocers. When the family prospered they became involved with the coalfields and iron works at Wick on the east side of Bristol. They built a mansion house, Wick Court, as the family home in the mid 1600s and the head of family became Lords of the Manor there for about 200 years. Although Sarah Hawksworth’s will clearly shows that the two brothers were made tenants in common the earlier land tax records only show one of them, the Revd Mr Haynes, as owner. This was Christopher Haynes. By the time of the 1840 Tithe Survey there was still only one member of the family listed – in this case Joseph Haynes who was the son of Joseph Haynes snr. We cannot explain the changes. Christopher Haynes was born in Wick on 31st May 1741. He was educated at Oriel College and obtained his M.A. in 1765. He became Curate at Mangotsfield and then the Rector of Siston for 31 years during which time he was the Domestic Chaplain to the Duke of Beaufort. He married Ann Lennott. An advert dated 1784 shows Christopher ran a school in Siston offering instruction in Latin and Greek. The school continued to operate and when Christopher died n 1806 it was taken over by his wife, Ann, with the assistance of others and it was moved to a former lunatic asylum at Cleeve Hill, Downend. Christopher was buried in Siston on 28th February 1806. In his will Christopher left his half or ‘moiety’ of the Thornbury property for the use of his wife, Ann, during her lifetime and it was then to be shared between his four daughters, Elizabeth, Rebekah, Christian and Phillippa, as tenants in common, during their lifetime, after which it was to pass to his only son, Richard. However things did quite turn out as planned. By 1827 Richard Haynes had got seriously in debt to John Grace and Robert Colesworthy, both of Bristol. It appears that the moiety which Richard was expecting to inherit was put up as security for the debt. Ann Haynes had therefore lost the family’s interest in the property. They were left with their moiety for three of the adjoining closes, Lower Close, Middle Close and Upper Close. The three closes were acquired by John Reed of Horton and following the death of Phillippa Haynes in 1863 , the last surviving child of Christopher Haynes, descended to his nieces, Ann and Sarah Butler. We don’t know what happened to Christopher’s moiety covering the farm building and the other plots of land and it is possible that they also passed to John Reed and to the Butlers. Christopher’s widow, Ann, died in 1843. Richard became a solicitor and he died aged 73 in 1846. Phillipa was the last surviving child and she died in 1863 when her address was Cleeve Cottage, Downend. We don’t know when Joseph was born. He was the son of Thomas and Sarah Haynes of Wick Court. Joseph left Wick and joined the Royal Navy, rising to the rank of Captain. He took his family to Ireland and lived in the area of Cloyne near Cork. Joseph married Philippa Palmer and they had one son, Joseph, born in Wick on 1st August 1781 and baptised in Abson on 12th November 1781. The family settled in Ireland in the area around Cork. Philippa died at Rostellan Castle about 1800 and she was buried in Cloyne Cathedral. Joseph married again in 1800. His second wife was Elizabeth Shute, the second daughter of Rev. Richard Shute and the marriage took place in Stapleton near Bristol. The Haynes family continued to live in Ireland and Joseph was appointed a magistrate and also served as steward for the Marquis of Thomond. By 1824 Joseph had returned to live in Stapleton in Bristol. Both Joseph and Elizabeth died in 1828 and they were buried in Stapleton. A Manor Court record dated 13th November 1828 refers to Joseph’s last will in which he left to his son, Joseph Haynes the younger, all his moiety or half part in the copyhold dwelling house or farm and lands in the parish of Thornbury in the occupation of Widow Grove. On 5th November 1805 Joseph Haynes junior married Mary Ann the second daughter of Colonel Abraham Augustus Nickson. The marriage took place in Middleton, County Cork. Mary Ann’s father had been involved in the 1798 Rebellion. He was given command of all the Yeomanry Corps in Counties Wicklow, Wexford and Carlow and killed by the rebels on 1st July 1798. The 1833 Tithe Apportionment record of Cork shows Joseph Haynes as owning properties in Ballynarfsid, part of Aghada, another town near Cork. He had also become a Justice of the Peace, like his father. In 1846 Joseph is listed as one of the nobility, clergy and gentry in directory for Cloyne. A Polling List for Thornbury dated 1839 gives the address of Joseph Haynes as Maryland House, Cork, Ireland. The list says that was the owner of one undivided moiety in a copyhold property called ‘Thornbury Farm’. 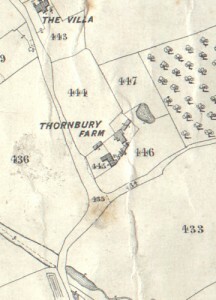 Joseph is also listed as the owner in the 1840 Tithe Survey for Thornbury. At that time the house was described as Plot 445, a farmhouse buildings and garden owned by ‘Joseph Haines’ and occupied by Mary Grove. Joseph also owned the adjoining land, plot 444 described as ‘The Walk’, plot 446 called ‘The Paddock’, and plots 447 and 448 known as ‘The Great Orchard’. Mary Grove was the tenant of these plots as well as the farmhouse. Joseph died on 29th November 1862 and the probate record still shows him living at Maryland House, Cloyne. He was buried in Ballinacurra near Middleton. One of his executors was Joseph Haines Nash of Clifton, Bristol. The property descended to Joseph’s widow, Mary Ann. An abstract of title for the property refers to an indenture dated 16th November 1863 in which Mary Ann sold her moiety now known as Thornbury Farm to Rebecca Carwardine. Mary Anne Haynes of Maryland House died 20th September 1878. She was also buried in Ballinacurra.